Arguably one of the most influential writers of the twentieth century, C.S. Lewis is widely hailed as a literary giant, his seven-volume Chronicles of Narnia having sold over 65 million copies in print worldwide. A prolific author and scholar whose intellectual contributions transcend the realm of children’s fantasy literature, Lewis is commonly read and studied as a significant theological figure in his own right. What is often overlooked is that Lewis first loved and was academically trained in philosophy. In this newest addition to the Blackwell Great Minds series, well-known philosopher and Lewis authority Stewart Goetz discusses Lewis’s philosophical thought and illustrates how it informs his theological and literary work. Drawing from Lewis’s published writing and private correspondence, including unpublished materials, C.S. Lewis is the first book to develop a cohesive and holistic understanding of Lewis as a philosopher. 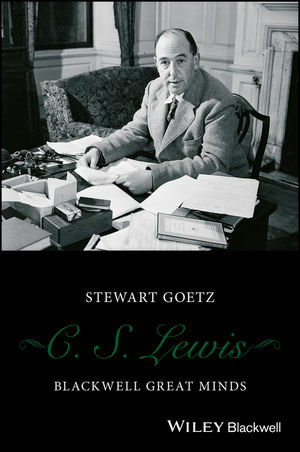 In this groundbreaking project, Goetz explores how Lewis’s views on topics of lasting interest such as happiness, morality, the soul, human freedom, reason, and imagination shape his understanding of myth and his use of it in his own stories, establishing new connections between Lewis’s philosophical convictions and his wider body of published work. Written in a scholarly yet accessible style, this short, engaging book makes a significant contribution to Lewis scholarship while remaining suitable for readers who have only read his stories, offering new insight into the intellectual life of this figure of enduring popular interest. Stewart Goetz is Professor of Philosophy at Ursinus College, and is a visiting scholar at St. Peter's College, Oxford. He has published over 60 articles, chapters, and reviews in philosophy and philosophy of religion journals, and co-authored A Brief History of the Soul (Wiley Blackwell, 2011). He is the author of A Philosophical Walking Tour with C.S. Lewis (2014), and is co-editing the forthcoming Wiley Blackwell Encyclopedia of the Philosophy of Religion.